CPLC PhD graduates who obtained tenure-track faculty positions (14 total): (1) H. Park, Physics, Hong Kong University of Science and Technology, (2014). (2) E. Villa, Chemistry, UC San Diego (2013). (3) I. Cisse, Physics, Massachusetts Institute of Technology (2013). (4) Y. Liu, Medicine, Harvard Medical School (2013). (5) E. Toprak, Systems Biology, U. Texas Southwestern, Dallas, Texas (2013). (6) M. Sotomayor, Chemistry & Biochemistry, Ohio State U. (2012). (7) A. Arkhipov, Allen Institute for Brain Science, Seattle (2012). (8) J. Gumbart, Physics, Georgia Tech (2012). (9) C. Kural, Physics, Ohio State U. (2012). (10) Y. Wang, Physics, Chinese University of Hong Kong (2012). (11) F. Khalili, Physics, U. Illinois at Chicago (2012). (12) R. Roy, Chemical Engineering, Indian Institute of Science, Bangalore, India (2012). 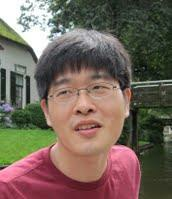 (13) C. Joo, BioNanoScience, TU Delft, Netherlands (2011). (14) G. Scott, Chemistry, Cal Poly San Luis Obispo (2011).